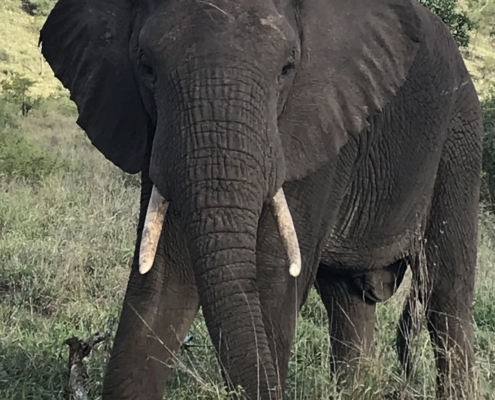 A new article in Conservation Biology reports on our research study, aimed to determine which factors could help to influence United Kingdom (UK) traders’ compliance with domestic ivory market trade regulations. Our findings conclude clearer regulations that facilitate easier detection of illegal ivory products and stronger prosecution of violations would be effective. To help mitigate decline of the African elephant (Loxondonta africana), countries with legal domestic ivory markets, such as the UK, were recommended by the Convention on International Trade in Endangered Species of Wild Fauna and Flora (CITES) to close domestic markets for commercial trade. However, implementing stricter regulations on wildlife trade does not necessarily mean compliance with rules will automatically follow. The UK was historically and remains today one of the largest ivory markets in the world. The British Antiques Dealers Association (BADA) estimates there are more than two million objects containing ivory in British homes and approximately 20,000 antiques dealers are believed to be working in the UK today. Although the majority of objects containing ivory in the UK are legal worked antiques, including furniture with ivory inlay, sculptures and pianos with ivory keys, the UK continues to seize ivory either on transit from Africa to Asia or re-exported en route to Asia. Newly poached ivory (post-1990) has been found to be traded under the guise of synthetic, ‘bone’ or treated to appear antique. Without DNA analysis is it almost possible to tell the difference. Traders are an important intermediate actor in the ivory trade chain as they can be involved in sourcing goods, financial links, coordinating logistics and directly communicating with consumers. Understanding their needs and the barriers to compliance can help support decision makers in crafting and evaluating regulations designed to conserve threatened wildlife. We found that although most traders support regulations, 61% of traders did not always check that they comply when trading objects containing ivory. All traders (98%) believed they had some knowledge of the regulations with 57% stating they were extremely or very familiar with the regulations. Traders’ ability to follow and understand the regulations. About half of traders did not find it easy to follow regulations (51%). Current UK regulations were viewed as complex, ever changing, and included confusing definitions, such as for “worked‟ ivory. It was also mentioned by respondents that it is difficult to find the right regulatory information. Traders’ perceptions of the regulations and punishments to deter illegal trade. We found that traders felt it was difficult for enforcement to detect illegal ivory weakening the perceived strength of the regulations. Results indicated that traders felt that providing law enforcement officials with sufficient resources to ensure they can identify legal ivory and monitor trade should be a priority over further trade restrictions. Compliance could be improved by clearer regulations that facilitate easier detection of illegal ivory products and stronger prosecution of violations. This is consistent with the findings and recommendations from other studies of wildlife crime in the UK. In the UK, wildlife crime enforcement demonstrates some best-practice globally however there is a threat of uncertain funding, lack of prioritisation against other crimes and lack of specialist training. Recent targeted ivory operations demonstrate an increased focus on the issue however due to the historical nature of the UK ivory market and the diverse range of traders involved, it is difficult for law enforcement authorities to monitor all illegal trade. Conservation criminology is an inter-disciplinary framework which combines insights from the disciplines of criminology, conservation, and risk and decision-making science to advance knowledge and practice relating to environmental crimes, harms and risks. These findings apply this framework by using an online questionnaire to fulfill the need to obtain accurate data on non-compliance and understand the drivers of this behaviour to guide the design of more effective interventions and thereby improve wildlife trade regulations. Although we considered the case of ivory trade regulations in the United Kingdom, our results have implications for wildlife trade regulations more generally in other geographies and conservation contexts. Please see the full article with further details.